is it a group pedicure or just everyone changing shoes for the hike? The wind blew most of the night and we listened to the rain fly flapping amidst the rolling sound of the surf. It is too windy to take the kayaks out this morning for us less adventuresome folks and so we take a hike up to the top of a ridge through some very rough terrain. I fall—a big surprise—as one minute I am upright and scrambling up the path and the next minute I am flat on my back rolling down the side of the mountain. Glen said it was quite spectacular and he was sure I would have to be carried out. After that, Don pulls me up in spots as does Glen. It is so frustrating not to do what I remember I can do. Late morning is no better with a lot of whitecaps and so we all ride the skiff to our next campsite. There is another group there with walled tents. We are somewhat jealous as they can stand in their tents and they have mattresses on raised bed frames instead of thermarests on the sand. This group is here to swim or snorkel. We set up our tents, Rob and Sue being really quick about fitting the exoskeleton tent together. I am glad they have not proposed a timed tent setting up contest. Glen sets up the rain fly with additional weights to limit the flapping and puts some sticks in the sand to dry his shoes at night and prevent scorpions from crawling inside. We take the skiff and go back down the coast to our original planned lunch site and take another hike up another mountain. It is rather rough but in a shady spot we see the rock painting of a turtle; and see the grinding stones. 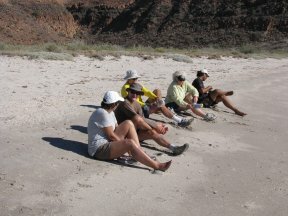 Rafael studied archeology and reviewed the history of Baja California with us. There is time before supper for Don and Sue to go snorkeling in the little bay while the rest of us felt quite hot so we soaked in the ocean and then rinsed off under the sun shower, amazingly and delightfully warm. Alvarito captured some clams earlier in the day that became ceviche for Happy Hour. Pina coladas and margaritas along with wine and beer are available but of course I can’t have any alcohol. The wind is picking up again but the moon is bright.